These price cuts are becoming a little dizzying as a call to John Cohen at Merle Wood & Associates confirms a $1.2 million drop on the 43.6m motor yacht Sea Falcon. Built in aluminium by Angus Yachts in 1990, she was refitted in 1999 and 2008. Accommodation is for up to 11 guests in five staterooms and twin 1015hp Caterpillar engines give her a range of 2,000 nautical miles at her cruising speed of 12 knots. 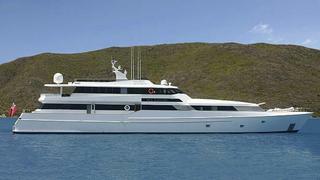 Lying in South Florida, Sea Falcon is down from $3.7 million to $2.5 million.